This post has taken a while for me to get round to doing! I was fortunate enough the be invited to a group interview on Thursday for a weekend job as a Fashion Advisor at John Lewis. Sorry that the dress is a bit creased in these photos as I wore it on the drive home from Nottingham, but I wanted to show you all what I ended up wearing to my interview. The dress is from River Island, (in all honesty) a shop I rarely go into these days. I wanted something simple but not boring and I think the cut of this dress makes it flattering and eye catching. It was £35, not a bad price considering it was made in Britain and I was pretty impressed with the quality of the materials too. Part of the reason I rarely shop in River Island is because I often find the fabrics they use aren't great for the price. I'm quite surprised the dress doesn't make me look tiny, as being 5ft 4 I don't find midi lengths great on me usually, but I guess the heels help me out a bit! The shoes are from Matalan, they were £18 and have brutally ripped my feet to pieces. I'm not blaming the shoes too much though, as I really should have worn them in. Court shoes always make me want to weep after a hour or so of wear - certainly not my most favourable type of shoe...! I shan't be wearing them again in a hurry... although the silver heel on them is lovely! My blazer was a bargain from the Topshop sale - I got it for £27 with my student discount! A price I am more than happy to pay as I have always found Topshop formal wear to be great quality. It was £60 full price (a little steep for my budget!) so finding it in the sale made me a very happy bunny! I love this bag I found in BHS, it was just £11 in the sale! I find so many cheaper bags look... well... cheap... and generally horrid. But this one looks like it cost a good £50! My jewellery is from New Look, if you read my blog regularly you'll know how obsessed I am with spiked things, so the necklace was a kind of statement piece I was comfortable wearing, along with an ivory and gold angular ring and pearl-look earrings. Wow, this post is long! I was going to write a bit about the interview but I don't want to ramble on (more than I already have..!). I should hear back within a week or so, I don't have my hopes too high as there was a current employee in the interview, who has worked in the department for a year so is clearly going to have the best chance of getting the job! But we will see. I might write a post about the interview experience for anyone who might be going for a similar role in the future, but I want to see what the outcome is first! Have a brilliant weekend - I'm off to Weymouth this afternoon to see what the atmosphere is like there on the last day of the Olympic sailing racing there (as far as I'm aware!). You look lovely! Very smart. I know what you mean about River Island's fabrics. Tres stylish Robyn! 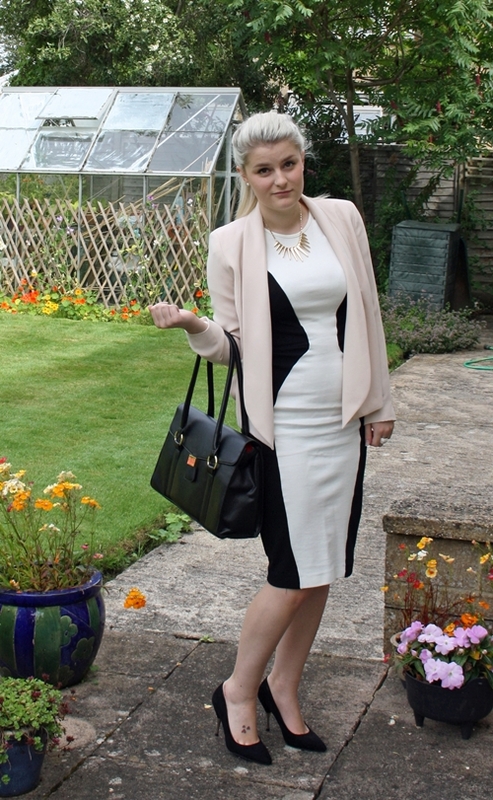 I do adore River Island and this dress is so perfect for an interview. V impressed with that BHS bag! Currently hosting a giveaway on my blog for a pair of galaxy print leggings! This is hte final week if you'd like to be in with a chance of winning!